This has a very adult flavour, not just because of the gin but also the bitter almond flavour contributed by the damson stones. The colour is fantastic. Put the damsons in a pan with the water and cook until the fruit is completely soft. Push the fruit through a coarse-meshed nylon sieve to remove the skins and stones. Depending on the type of damsons used you will have about 350 ml of purée. Add the sugar in stages, stirring to dissolve and tasting after each addition, until you are happy with the sweetness. 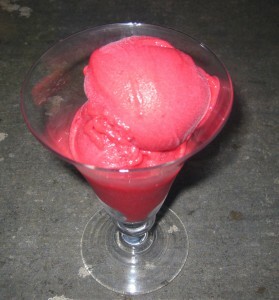 Add the gin and chill thoroughly for several hours or overnight before churning in an ice cream maker. Cut the plums in half to remove the stones and then lay them, cut side uppermost, in the dish. Sprinkle with vanilla sugar (or plain caster sugar) and place in the pre-heated oven whilst you prepare the topping. This initial cooking is not essential but does enable you to fit them in the dish more easily! Mix the flour with the oats and rub in the butter. into the flour. Mix in the chopped cobnuts and demerara sugar. Cover the plums and press down lightly. Bake at Gas Mark 6/200°C for 20-30 minutes until nicely browned. Make the pastry by combining the ingredients in a food processor. Wrap and refrigerate for 30 mins to an hour. Roll the pastry and line the greased tart tin. Return to the fridge to chill for a further half hour or so. Preheat the oven to 200°C Gas Mark 6 whilst the pastry case is resting. Process the almonds in a food processor until they are quite fine. Put them in a mixing bowl and then add the remaining ingredients, whisking in the eggs and butter at the end. When you are ready to cook the tart, put the blind pastry case into the oven and turn the heat down to 180°. After 10 minutes remove the case from the oven, add the filling and bake for 5-10 minutes until it is just beginning to set and will enable you to arrange the greengages without them floating. Llay the greengages halves (or quarters if you prefer) so that they are just overlapping, all around the edge to the tart case. 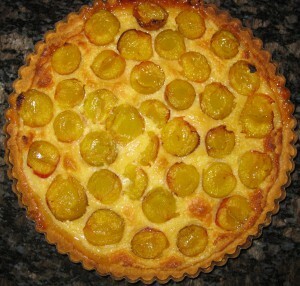 Continue to cover the rest of the tart case with halved greengages, cut side uppermost. This is so simple it barely warrants a recipe. 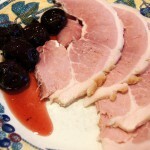 I serve it with duck, but it is also good with gammon. Cook the damsons or plums with a splash of water and the star anise until they have collapsed. Push through a nylon sieve to remove the stones, skin and the star anise. Now taste the purée. It will be sharp, but how sharp depends on the fruit you have used. Add sugar and balsamic vinegar to achieve a nice sweet-sour balance remembering that it is a savoury sauce so should not be too sweet. Put all the other ingredients in a saucepan and heat gently, stirring until all the sugar has dissolved. Brush around the edges of the pan with a wet pastry brush to dissolve any sugar stuck here and then only when all of the sugar has dissolved, turn up the heat and bring to the boil. Pour the syrup over the damsons, cover and leave for 24 hours. The following day, drain off the liquid and bring to the boil again before pouring it back over the damsons*. Leave for a further 24 hours. On the third day, sterilise the jars you will be using, either in the hottest cycle of a dishwasher or by hand washing and placing in a roasting tin containing about an inch of water. Heat to 120°C to sterilise. This time boil the damsons with their liquid but remove the damsons to the jars as soon as it comes to the boil. The liquid can then be boiled for a while longer to reduce and thicken it slightly before it is poured over the fruit. * This is a heavily saturated sugar syrup, but overnight the damsons should have added some of their juice to the liquid. If however the sugar has crystallised out, heat just the liquid whilst at the same time heating the bowl and sugar in a low oven with a little more water. Gradually stir in the now warm syrup until all the sugar has dissolved and then bring the whole to the boil again.